Quickly re-order a past order. Payment information is not stored. 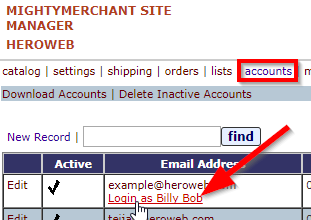 Customer-initiated accounts allow your customers to create an account with a user name and password of their choosing. Customer-initiated accounts will automatically be added to your Accounts Manager. Accounts can be created manually through the Site Manager. Fill out the fields for the account. 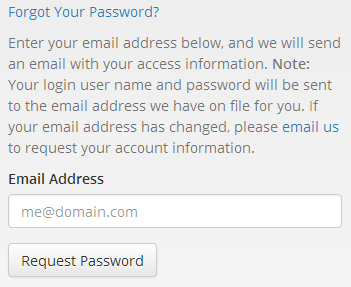 At minimum, you will need to fill in a user name and password, plus set Active to Yes. Customer-initiated retail accounts are automatically set to be active accounts and the customer may log into their account immediately. You do not need to take any action. If your site offers wholesale customer accounts, you will receive and email when someone signs up for a wholesale account. Depending on the specific requirements of your site, you may need to activate the account before the customer can log in. Click "accounts" to access the Accounts Manager. Click "Edit" next to the account you want to edit. Set the appropriate account group (if wholesale is enabled). Customers may log into their account using the Account Login link on the site. Site owners can log into a customer's account from the Accounts Manager. Click the "accounts" link to access the Accounts Manager. Click "log in as customer"
Click "View/Update Account" link after logging in as the user. 4. 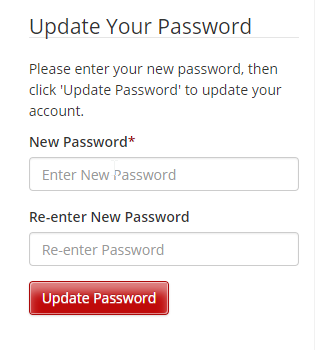 Notify the customer that their password has been reset and provide them with the new password. Be sure to tell them they can also change their password at anytime by clicking "My Account" and going to "View/Update Account"
Click "Edit" next to the account you want to change. 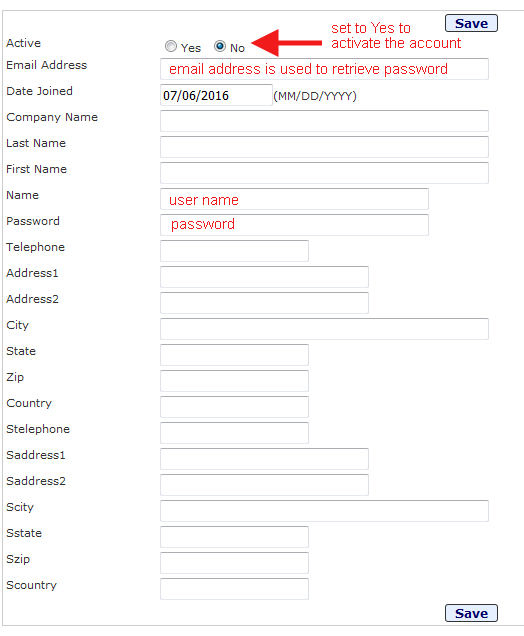 Passwords for an account can be retrieved by using the Forgot Password form. The password will be sent to the email address on file for the account. If the email address for the account has changed, the customer may contact you to change the password. There are a number of items in your Messages Manager that are displayed on various accounts pages throughout your site. Click "Edit Message" for one of the following items (message contents show in red box).